The Wi-Fi Alliance would have you think you can now connect anywhere and everywhere. It's not so. Existing wi-fi networks often fail to deliver, which can be especially frustrating when you're paying ridiculous prices to hotels for access to their networks. 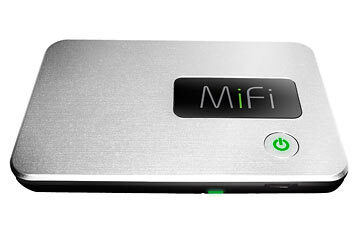 Novatel's MiFi Intelligent Mobile Hotspot takes away your wireless headaches by tapping seamlessly into Sprint's and Verizon's vast 3G networks. Pricing varies among service plans, but the 5-GB data plan for $60 a month is your best bet. Like with any new phone, you'll have to sign a two-year contract, but you'll never have to go hunting for a hotspot ever again.